Here is the Ganges. Serene, and peaceful, she is the narrowest here. I believe she is only 20 metres deep here. 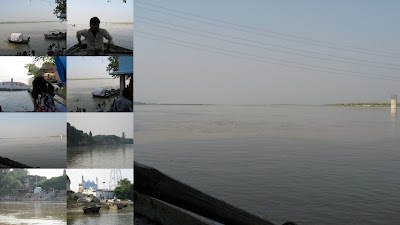 This place is called Bithoor, about 30Km from where we live in Kanapur. It has one of 3 temples to Lord Brahma on it's shores. If you expect a beautiful temple, it is disappointment time. There is a small shrine which says, Brahmesvar that's all. It is dirty in parts, more muddy than dirt. I would say it is much cleaner than what I expected. A lot of effort is being put into keeping the Ganges clean especially in these parts. There is one organisation called "ecofriends" here, that is doing a lot of work on the Ganges. It was quite thrilling for me to see the river, as I imagined the many Kings and Sages who had touched this river. It is the river of our Myths. It made me feel minute in the wake of it's immortality. Near this Ghat is a shrine to the Sai Baba, a beautiful temple, similar to the shrine in Shirdi. We paid homage, took the prasad, and returned back to Kanpur. A simple peaceful day, well spent. My husband too had a good break. I liked what you wrote. Many people and things would have gone up and down this river.Very rarely I think abt. such things. Good imagination and it made a nice read. Yay sow... you seem to be having a rocking time in Kanpur! Ensaai!